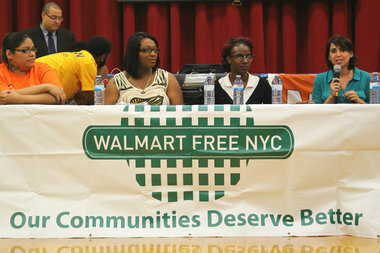 East New York residents and retail workers joined a panel for Walmart-Free NYC Wednesday night to discuss the need for "high-road" retail jobs in the rezoning of East New York. EAST NEW YORK — Community groups and elected officials are calling on Mayor Bill de Blasio to ensure that retail jobs are secured for residents in the planned rezoning of East New York. Locals and members of Walmart-Free NYC, a coalition of community, labor and faith-based organizations, gathered at a town hall meeting Wednesday night to discuss strategies in strengthening the area’s economy. Councilman Rafael Espinal, who co-hosted the event, advocated for living wages and local hiring as part of the city’s proposal for his neighborhood. East New York is the first of 15 neighborhoods targeted by the de Blasio administration as part of a plan to add or preserve 200,000 affordable housing units over 10 years. More than 1,200 units are planned for the area, but that's not enough, Espinal said as he addressed the crowd at Brooklyn’s Blessed Sacrament Church auditorium. “We have to always talk about creating good, solid jobs in the neighborhood,” the councilman said. Members of Walmart-Free NYC, who are spearheading a petition to the mayor, ask that “high-road retailers” be prioritized in providing employment opportunities for longtime residents. As part of the desired business model, the coalition asks that new retailers coming into the area be required to hire a percentage of their workforce from the community, provide job training and benefits and create stable schedules. “Low-road” corporations and retail giants like Walmart are unwelcome, members and Espinal say, due to low wages and unfair treatment received by workers. “East New York is a really important site in how the city decides to move forward in any development,’ said Audrey Sasson, director of Walmart-Free NYC. Rezoning “done right” is possible, she added, provided that there is a commitment from the community and political stakeholders to explore all options. Residents and panel members at Wednesday’s town hall expressed worries that the massive overhaul anticipated for East New York could mimic the changes seen after the rezoning of Downtown Brooklyn and Williamsburg. The arrival of luxury buildings signaled the displacement of many locals who could no longer afford to live in those neighborhoods, residents said. The guarantee of jobs would be a guarantee for a future, according to Rachel Rivera, an East New York resident and member of New York Communities for Change. “Without good jobs, we’re being pushed out,” Rivera said. The single mother of six said she had to ask her two eldest children to work in order to help support the family, and they were unable to find employment in the immediate area. Walmart-Free NYC played a role in keeping Walmart out of East New York’s Gateway Center in 2012, coalition members said. The alterative is a ShopRite that currently employees union workers. Town hall attendees also raised concerns for the protection of small businesses in the community. Espinal is working with the mayor’s office to allow the city’s Department of Small Business Services to conduct a survey of the neighborhood’s major retail corridors, the councilman said. The aim is to find the needs of local owners and entrepreneurs, he added, and other initiatives planned include providing legal assistance to current owners to ensure business' longevity in the community. Under the city’s current proposal, the rezoning also plans to connect residents to career opportunities, provide business training, as well as employment services to court-involved individuals. “We’ve worked closely with Council Member Espinal as we’ve undertaken this neighborhood planning effort and look forward to making sure it delivers more economic opportunity for East New York residents,” said Wiley Norvell, a spokesman for the mayor's office. Many locals said they still remain skeptical, however, until they see the changes to come. “I see a lot of things that have been promised to this neighborhood that never came to fruition,” said Betty Cooney, who has lived in East New York for more than 60 years.